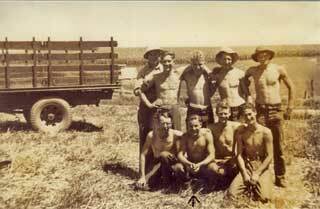 The boys of the Civilian Conservation Corps worked hard for their $30 per month. John Buskowiak, an enrollee at Camp 2709 at Plainview, Minnesota, spent long days on a fencing crew and learning fire fighting techniques, as related in the following excerpts from his memoir, "My Days in the C.C.C.'s." As I remember the boys who worked in the field were divided into surveying crew, some on the sod and rock flume crew, some were fence post cutting crew, some on the fencing crew. Well I started on the fencepost cutting crew. We went into the woods overlooking White Water River in S.E. Minnesota on the bluffs and cut fence posts by the hundreds. We peeled the bark off each one. Those bluffs above White water were loaded with rattlesnakes. It was nothing to bring in 10 or 12 snakes a day into camp. Of course we had kits we could use in case any of us were bitten but luckily none of us were. After the few weeks in cutting posts I was transferred to the fencing crew. Here we dug fence post holes 21/2 ft. deep. And set posts in them. We dug all our fence post holes by hand, that is by a hand digger, no power hole digger in those days. On those rocky bluffs we would have to chisel through all rock for 2 ft. with a crow bar and hand digger. Some holes took us a half day just to dig 21/2 ft.
Each noon we changed off as to who would cook the noon coffee. We would put a pound of coffee in a large cream can and build a fire side of it and let it boil. We each were furnished a canteen cup which we drank our coffee out of. When it was raining out it became a problem to try and start a fire but you really heard about it. We built miles and miles of fence for farmers to teach them about strip farming and contour farming. One day when some of the boys were streching barb wire the barb wire broke and does it ever curl when it breaks. 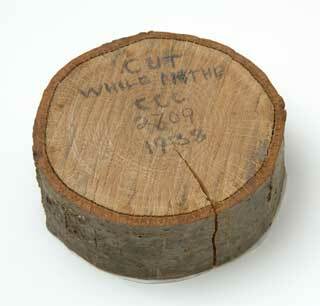 I was in the way and got a nice cut across my back, I was taken immediately into camp and sewed up. They also gave us some training in fire fighting. On Saturdays when we didn't work in the field we would take this training. They would take us out in the country, about 100 of us boys at a time. They would pick out a fairly large block of woods and station us boys around the outside of the woods with shovels and saws in hand. They would set a fire in the middle of the woods with gasoline and then give the word to us boys to put it out. It meant all of us moving in from all directions toward the flames. Some of the boys would dig trenches about 3 yards wide so that any surface burning would come to the trench it would not cross and would stop burning. Others would saw down trees and make a path so that the fire could not jump from tree to tree. Then with our shovels we would try and stamp out all surface fires. They told us we may be called up North to fight fires but we were never called. John Buskowiak and fencing crew, Plainview CCC Camp, 1938. 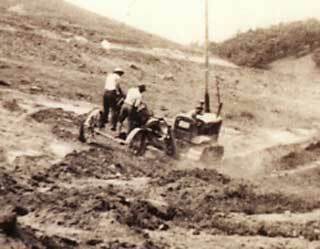 John Buskowiak driving heavy equipment, Plainview CCC Camp, 1938. 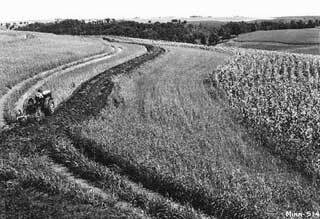 Contour plowing near Millville, Wabasha County, 1937. 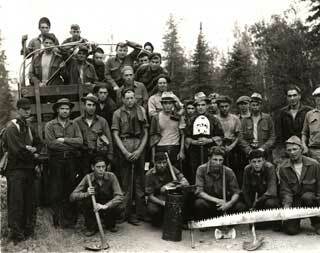 CCC fire fighting crew at MacFarlane Lake, 1936. Object: A fence post fragment from CCC camp 2709, Plainview. Buskowiak, R. John My Days in the C.C.C.’s. MHS Manuscripts Collection, 1993.